One worker was killed and another injured as large concrete prefabs fell off the upper balcony. It's not clear at this point, what caused the accident and how it may influence the project. Palmeiras announced they will mourn the deceased worker in their upcoming game. Yesterday in the morning a tragic accident took place at Arena Palestra Itália's construction site. Four supports of what was to be a skybox balcony gave way, allowing for concrete prefabs of first rows to fall down. One of the 3-ton elements fell onto Carlos de Jesus (34), killing him instantly. Another worker was taken to hospital with injuries. 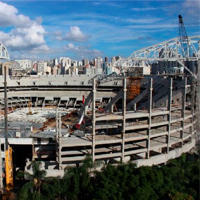 The scene unfolded in northern section of future Palmeiras arena. You may see the blocks which fell down on the photo below (red). At this point it isn't clear, whether (and how) the accident may influence the project's delivery, long overdue. General contractor WTorre announced a thorough investigation into the causes of what happened. One of the concerns is whether a major redesign won't be necessary if it turns out that supports that gave way weren't calculated rightly. Stadium tenants Palmeiras issued a statement in which they support Carlos de Jesus's family. To honour the deceased worker they plan to play their next fixture with black armbands. The club also requested CONMEBOL to allow the Thursday Copa Libertadores game against Sporting Cristal (Peru) to be preceded by a minute's silence. Arena Palestra Itália was initially planned to open this month, but with massive delays the plan hasn't been viable for months. Currently November is officially expected as delivery date, but very unsure, especially after the accident. Palestra Itália is not on the list of 2014 World Cup arenas. Sao Paulo's venue is Arena Corinthians in distant district of Itaquera.